Police surround the Rehabilitation Center in Hollywood Hills, Fla., which had no air conditioning after Hurricane Irma knocked out power, Wednesday, Sept. 13, 2017. Several patients at the sweltering nursing home died in Hurricane Irma's aftermath, raising fears Wednesday about the safety of Florida's 4 million senior citizens amid widespread power outages that could go on for days. HHS Secretary Dr. Tom Price on Monday met with Florida Gov. Rick Scott to discuss recovery efforts after Hurricane Irma, just days after the deaths of eight nursing home residents. Price, along with Assistant Secretary for Preparedness and Response Dr. Robert Kadlec, met with Scott in Marathon, Fla. It's unclear if they discussed the seniors who died. The nursing home is now under criminal investigation, and Scott has announced new rules to ensure nursing homes are better prepared for storms. Early last week, eight seniors at the Rehabilitation Center at Hollywood Hills in Broward County, Fla., died after the nursing home's air conditioning went out in the wake of Hurricane Irma, which made landfall in the state on Sept. 10. 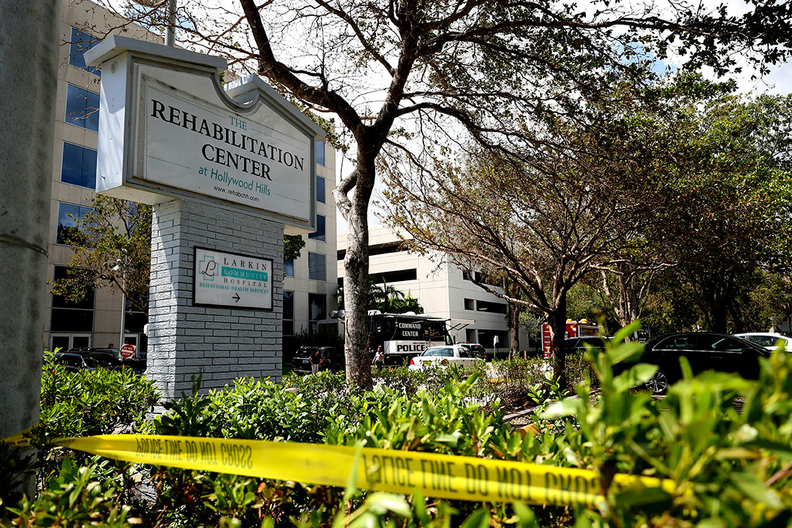 Although portable air conditioning units were being used, the nursing home was "excessively hot," according to a statement from the city of Hollywood, Fla.
After rushing several patients to the emergency room in the early hours of Sept. 13 and finding three already dead in the facility, fire rescue crews and police ordered the nursing home's 158 residents to be evacuated. The nursing home stated that while the facility did not lose power during the hurricane, it lost one transformer that powers the air conditioning unit. The nursing home said it immediately contacted the local electricity company, Florida Power and Light, and emergency officials. The nursing home also said it called Scott's emergency cellphone number for help within 36 hours of the patients' deaths. The governor's office said it transferred those calls to the Agency for Health Care Administration and the Florida Department of Health, and that those calls were quickly returned. The governor's office also questioned why the nursing home didn't call emergency services earlier. The Florida Department of Health also pushed back against the nursing home's claims. "It is 100% the responsibility of health care professionals to preserve life by acting in the best interest of the health and well-being of their patients," the department said in a statement. Officials also pointed out that the nursing home is located across the street from one of Florida's largest hospitals, which never lost power and was fully operating. Earlier in the week, Scott said he was "absolutely heartbroken" to learn of the deaths at the nursing home and pledged to "aggressively demand answers on how this tragic event took place." He directed the state's Agency for Health Care Administration and the Department of Children and Families to work with law enforcement to conduct an investigation and promised hold accountable anyone who didn't act in the patients' best interest. Scott also directed the Agency for Health Care Administration to terminate the nursing home as a Medicaid provider. Over the weekend, Scott announced new rules requiring nursing homes and assisted-living facilities to obtain resources, including a generator and enough fuel, to sustain operations and comfortable temperatures for at least 96 hours following a power outage. Facilities have 60 days to meet those requirements. The same standards are already required at Florida hospitals.